Just a quick post this week of a tried and true. I am a big fan of chocolate cake. Like, maybe the biggest. I don't really find vanilla to be all that exciting, nor am I happily riding along on the red velvet bandwagon. I do, however, adore a rich chocolate cake. And that is likely why I love my Devil's Food Chocolate Cake recipe (noted in an earlier post). Gracie and I often enjoy a play date with our new mommy friends, and we obviously have to take snacks! So, I found myself wondering what I would take to our last outing. Cookies? Cupcakes? Another sweet treat? Why yes! Yes, I am the person who religiously brings sweets. So sue me. It just so happened that I had a chocolate cake in my freezer because of an expected, and frustrating, happening as I was making Grandpa's golf cake. Perfect! And since I had some berries from the Farmers' Market... why not make a delicious berry buttercream? 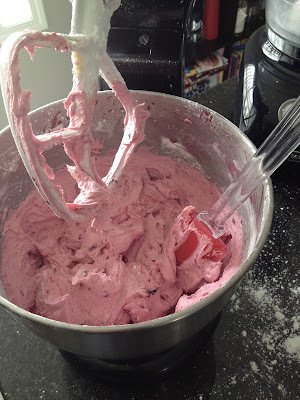 In the bowl of your fabulous mixer (again) fitted with the flat beater, cream the butter with the vanilla and salt. Slowly combine the confectioners' sugar and the milk. I find repeating the cycle of adding one cup icing sugar and 1 tablespoon of milk achieves the best results. Plus, you're less likely to be covered in icing sugar and have one hell of a mess to clean up later. Beat on low speed until combined. Stop the mixer and scrape down the sides of the bowl. Increase the speed to medium and beat for 2 minutes, then reduce to low and slowly add the berries until combined. Increase speed again to medium and beat for 1 minute more. I find the measurements of this recipe spot on, but if the frosting is dry, add more milk, 1 teaspoon at a time, until it is creamy but still holds peaks. Makes about 4 1/2 cups of buttercream: I find just enough to decorate one cake or 18 - 24 cupcakes. You can also find cake construction and decorating tips with the recipe noted above. I did it up with a whack of buttercream roses but did not add fresh berries in the middle. For no reason in particular other than I felt the berry buttercream drove the point home enough that the berries would be superfluous. As you can see, it wasn't a pretty cake. Give it a quick crumb coat and chill.